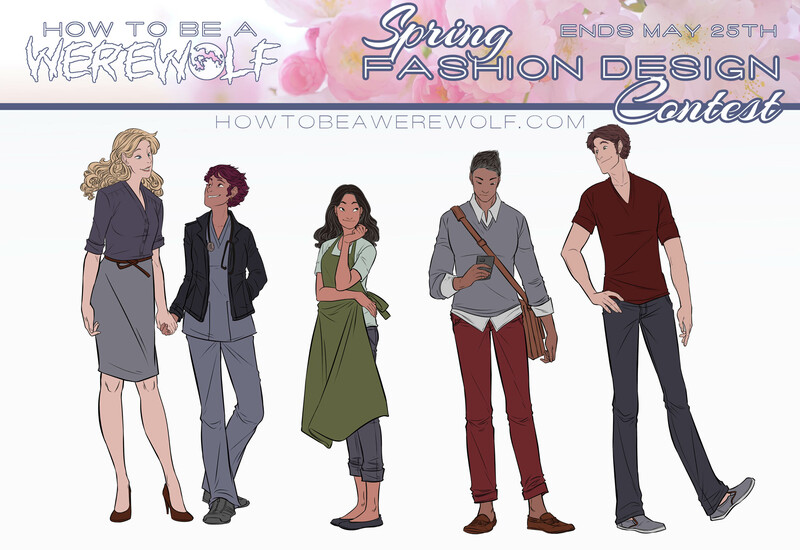 How to Be a Werewolf - Let's have a fashion design contest! Let's have a fashion design contest! There's a good chance I'll put some of these into the printed version of this book at some point, even if you don't win, in which case I'd recommend working at 300 dpi just in case :). If you're not interested, that's also totally fine, and I'll check with everyone before I put any artwork into the book. Marisa and Marin's bases are connected. If you only wanna design for one of them, leave the other one alone and I'll plug in a clothed version over her lol. I just didn't want to separate them because it's cute. You don't have to just draw them standing around. As long as there are clothes in the image and I can see them, we're good. Only really need a front view, but you can draw a back view if you want. It's not 2002 anymore, so no low-rise flare jeans with the thong peeking out the top. It wasn't cute then, and it's extra weird now. I'm totally on board with having a costume contest around Halloween, and if you wanna dress Elias like Legolas the elf for this contest, I'm not going to stop you, but I'm only considering stuff that people might theoretically wear out of the house that wouldn't involve going to a convention. How to Submit: You have many options! The best option is to upload your artwork somewhere, like DeviantArt, Behance, Tumblr, Twitter, wherever, and send me a link. That way, when I post your artwork here, I can also give you a link back to wherever you keep the rest of your stuff and people can find you. If you don't normally upload your artwork anywhere, that's fine! Just send it to me as an attachment. If you upload your artwork to a site like Tumblr or Deviantart or whatever, it'd be super cool if you could put a link to How to be a Werewolf with your artwork so other people can also join the contest and read my comic :). You can either tweet your art at me or email your links to me at shawnlenore @ gmail . com. (Trying to avoid spam here, so reassemble that.) OR, if you want to, you can post a link to your artwork in the comments and we'll do it that way. Just make sure you're registered with your actual email so I can follow up with you later. (I can see your emails in my website dashboard.) If you submit artwork to me through whatever method, I'll try and get back to you within 2-3 days to confirm that I've got your stuff. If I don't get back to you, please remind me, just in case it got lost in the fray or didn't go through. I'll be tracking everyone's stuff in a spreadsheet. Please put your name/username/url/whatever on your art somewhere! Just in case I mess something up and have no idea who sent it to me. How to Win: Here's the part where I'm going to be sketchy, because I'm not sure yet lol. My goal is to get enough entries that I can choose 8-10 winners. (10 would be ideal, but if I only get 10 entries, I want to pick the best ones, so...not all 10.) The process of narrowing these down will largely be based on me uploading them to this site (I'll be creating a separate gallery so you guys can look at them all! ), and then forcing my real life friends to help me choose the winners. I say force, because I know my friends. I will probably also be running a poll on Patreon to help as well. If you win, then I'll draw your outfit into the comic, and when this sucker gets printed, I'll give you a shoutout for your design in the book, and put your art in the book if you're cool with that :). Disclaimer: By entering this contest, you agree to let me upload your artwork here on my site in a gallery with all the other entries. Your art will be credited to you, and you'll retain ownership of the original artwork. Obviously, all the characters are mine and copyright to me. If you change your mind about having your artwork featured on this site in the future, just contact me and I'll take it down.